This artistic basin is not only a practical sink for everyday use, but also an adornment for your living space. The roughly shaped outer surface, with an incorporated decorative stripe pattern, adds a rustic touch to the wash basin. On the other hand, the round shape of the basin makes it seem elegant and soft. The striking counterbalance of the rough yet elegant exterior surface makes this basin unique and artistic. This marble wash basin, featuring a rustic, yet elegant design, is suitable for any bathroom or washroom. The inner surface is smoothly polished, making cleaning really easy. 【UNIQUE AND ARTISTIC】The striking counterbalance of the rough yet elegant exterior surface makes this basin unique and artistic. This artistic basin is not only a practical sink for everyday use, but also an adornment for your living space. 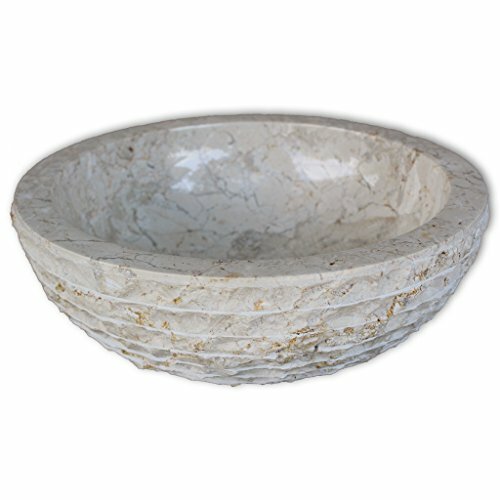 【STYLISH AND DURABLE】This round wash basin, made of natural marble, will make a stylish addition to any bathroom or washroom. 【SINK DIMENSIONS】Total dimensions is approximately 15.7"
【EASY TO CLEAN】 The inner surface of the sink is smoothly polished, making cleaning really easy. If you have any questions about this product by Festnight, contact us by completing and submitting the form below. If you are looking for a specif part number, please include it with your message.